Silver Sage Sports and Fitness Lab is presenting two clinics to help attendees prepare for the 35th Donner Lake Triathlon, held in Truckee, Calif., July 23-24, 2016. The event features an epic setting, a beautiful and challenging course and is located very near Truckee and North Lake Tahoe. 2016 also marks the 6th annual Donner Lake Kids Triathlon and the 4rd annual Donner Lake Half Triathlon. The first clinic will be held at the South Valleys Regional Sports Complex (15650 Wedge Parkway) on May 2, from 5:30-7:00 p.m. It will be a discussion outlining the details and demands of the race and how to properly train for the event. Julie Young, head coach and director of Silver Sage Sports and Fitness Lab and pro XTERRA/mountain biker Suzie Snyder (a Silver Sage-sponsored athlete), will discuss the importance of proper bike fit, performance strategies, common mistakes that athletes make and injury prevention techniques to make sure participants arrive at the triathlon in the peak condition. Attendees are asked to bring yoga mats and mini-bands with them to the first clinic. The second clinic will be held June 20, from 5:30-7:00 p.m., with the location dependent on weather. The clinic will be an active session leading participants through a mock race day beginning with transition set-up, warming up and finally executing the race. Participants should bring the appropriate equipment and be prepared to swim, bike and run very short segments of each discipline. A suggested donation of $15 is highly encouraged. It will benefit Bike Like A Girl, a local non-profit group empowering adolescent girls through cycling. Silver Sage Sports and Fitness Lab is presenting two clinics to help attendees prepare for the Tahoe Rim Trail Endurance Runs, taking place July 16, 2016. The 55K, 50M and 100M races will will be run on single-track trails and dirt roads within Spooner State Park and on the Tahoe Rim Trail located within the state park and on National Forest land all at or above 8,000 feet of elevation. The first Silver Sage clinic will be held at the South Valleys Regional Sports Complex (15650 Wedge Parkway) on May 9, 2016 from 5:30-7:00 p.m. Clinic attendees will hear from Julie Young, head coach and director of Silver Sage Sports and Fitness Lab and pro XTERRA/mountain biker Suzie Snyder (a Silver Sage-sponsored athlete), who will focus on training principles and injury prevention exercises to teach runners how to prepare for an ultra-distance race in the 10 weeks before the event. Overuse injuries are extremely common among runners so participants should come prepared to move and practice specific exercises and running mechanics drills in order to strengthen their bodies and avoid injuries before it is too late. Attendees are asked to bring their yoga mats and mini-bands with them to the first clinic. The second clinic will be held June 6, with the location dependent on weather. Participants will learn how to effectively taper their training in the final five weeks before the event and discuss race strategy and logistical concerns for event day. Attendees should come prepared to run. Silver Sage Sports and Fitness Lab is presenting two clinics to help attendees prepare for the XTERRA Tahoe City races, which celebrate the natural environment of Lake Tahoe’s excellent terrain, trails and blue water. Both the XTERRA Tahoe City and the XTERRA Lake Tahoe are qualifying races for the XTERRA USA Championship. The first Silver Sage clinic will be held at the South Valleys Regional Sports Complex (15650 Wedge Parkway) on April 18, 2016 from 5:30-7:00 p.m. Clinic attendees will hear from Julie Young, head coach and director of Silver Sage Sports and Fitness Lab and pro XTERRA/mountain biker Suzie Snyder (a Silver Sage-sponsored athlete) as they outline the details and demands of the race and how to properly train for it over the nine weeks leading up to the event. They will discuss performance strategies and key workouts, while also demonstrating injury prevention and specific strength exercises to build explosive power to help prepare for race day. Attendees are asked to bring yoga mats and mini-bands to the first clinic. The second Silver Sage clinic will be held Monday May 23, with the location dependent on weather. The clinic will provide participants with a tour of the bike and/or run courses to prepare for event day. Young and Snyder will address technical aspects or obstacles on the bike course and answer questions about proper techniques and strategies. This clinic will involve running and mountain bike riding, and attendees are asked to come prepared to run and ride. Silver Sage Sports and Fitness Lab is presenting two clinics to help cyclists prepare for the Carson City Off-Road, presented by Epic Rides. Joining April’s Whiskey Off-Road in Prescott, Ariz., and May’s Grand Junction Off-Road in Grand Junction, Colo., the Carson City Off-Road is scheduled for June 17-19. The race will feature three graduated distance course offerings, from professional to amateur, including the recently opened Ash to Kings Trail along west Carson City, and will offer a Pro Purse of $100,000 across all three events — the most significant cross-country mountain bike purse worldwide. The first Silver Sage clinic will be held at the South Valleys Regional Sports Complex (15650 Wedge Parkway) on April 11, 2016 from 5:30 – 7:00 p.m. Attendees will hear from Julie Young, head coach and director of Silver Sage Sports and Fitness Lab and pro XTERRA/mountain biker Suzie Snyder (a Silver Sage-sponsored athlete), who will discuss: the importance of proper bike fit; how pelvic and spinal posture directly affect injury prevention and performance; efficient pedaling technique; off bike exercises to prevent injuries and improve performance; and key workouts to help riders prepare in the nine weeks leading up to the event. Attendees are asked to bring yoga mats and mini-bands to the first clinic. The second Silver Sage clinic will be held May 16, 2016, from 5:30 to 7:00 p.m. with the location dependent on weather. The clinic will help riders prepare for race day by discussing and possibly riding parts of the course, depending on weather and trail conditions. If the trail is in good condition, riders will be led on a course preview with discussion of technical considerations and riding technique demonstrations. In case of poor trail conditions, a road ride may be substituted and attendees will learn a key training workout that can be implemented for the remaining four weeks prior to event day. This clinic will take place on mountain bikes and attendees should come ready to ride. As the weather gets warmer, the snow on the mountains begins to melt and days get longer, it’s time to get the bike out of the garage. Whether you’re dipping your toes into the world of cycling, or you’re already an experienced rider, a professional bike fit may be the key to a more comfortable and efficient ride. A bike fit is a series of measurements and adjustments used to fine-tune a bike to its rider. A bike fit can help a cyclist become more efficient, allowing them to ride faster and longer, with more comfort and power. Many bike shops offer fits with the purchase of a bicycle, and certain fitness centers also offer bike fits. But a professional bike fit, conducted by someone trained in biomechanics, can offer more than simply manipulating parts on the bike. Professional bike fitters invest time and skills to evaluate an individual’s unique biomechanics, as well as riding and injury history. This knowledge allows them to fine-tune the bike to the body, which provides optimum power output while reducing over-use injury potential. While many bike fits are focused on the bike, a professional bike fit is focused on the individual and his or her relationship with the bike. 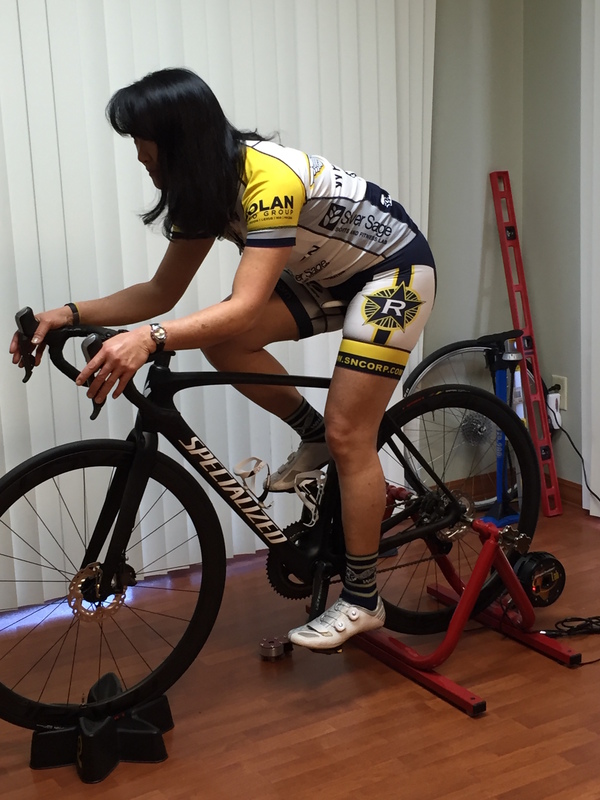 Lucie Oren at her latest bike fit, conducted by Julie Young.